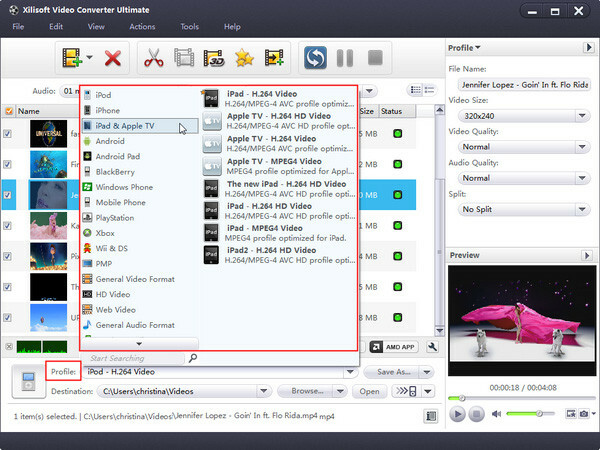 How to convert FLV to MP4 with Xilisoft Video Converter? Flash video (FLV) is a streaming video type which is used for YouTube and other video sharing websites on line. Usually, FLV video is played by a Flash player. Since other players or portable media devices can not support such format, people who have iPad or PSP may need to convert FLV to MP4 format video. With this FLV to MP4 Converter, you will be able to do such conversion in a few steps. Download and install the free version now. Click "Add File" button on the toolbar or "File> Add File" to load files. Click “Profile” button to select the output format in the drop-down list. Then click “Browse…” button to specify destination folder for saving output files.